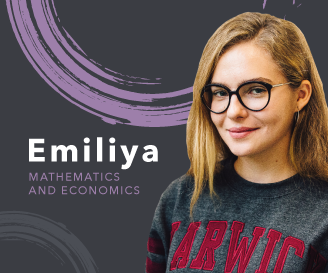 Emiliya is from Belarus and completed the Mathematics and Economics programme in 2017-18. Emiliya is now studying BSc Economics at Warwick. For a year I was searching for information about the UK in general - since I was 10 I wanted to come to the UK for study! I studied in a Belarusian school, so I had to do one more year to get to the university - I knew I had to do a foundation or A-levels, but I already knew I wanted to come to Warwick so I wanted to come here to be a part of the university even before undergraduate study. I think I’ve made a great choice because we all feel like we’re students in the university! I thought I was quite good at Maths but here the way they write things is so different from our variant, so I'm just getting used to that. But in general, it's fine - I really like the teachers and they explain everything really clearly and explain things if it’s difficult for you. Is the teaching style different here to Belarus? Here we have to think more analytically and critically rather than back home. We have to use the formula itself to give the answer, but here the tasks are so similar to the tasks that were high level in Belarus, where you need to think, not just a normal task with a specific method. Here we always have to think; that’s better because you practise thinking. Do you like the teachers? I really like the teachers. In comparison to teachers in my school, teachers here are more open-minded. They try themselves to help us to understand, because I think they realise it’s difficult for us to change the education system itself. They really help us and they’re all so kind and nice. Even in the lectures we co-operate. We might have 50 people, but people aren’t afraid of asking questions; we’re all in the same place and we try to help each other to solve a particular task. Have you found it easy to make friends on the course? I came here the first day of the course so I was one of the first people who came here and the first day I didn’t know anyone at all and I was wondering how to find someone. So helpfully we had a Facebook chat and we texted each other to meet and so from the first day we began meeting new people and actually here it is so easy because we’re all in the same situation and most people here don’t even know other students. I met some students from my country and I didn’t know they were coming here and I also met some undergraduate students who are studying economics. That was really useful because they told me about the process of studying at undergraduate level so it’s quite easy because we’re all a community. Like a family actually; we’re all together all the time, I really like this.